When we think about the term “salad”, we usually think about a dish that is prepared soon before serving and and is eaten as fresh as can be. However, it’s always good to remember that not all salads were created equal, and that many of them taste even better after marinating for a few hours, or even days. 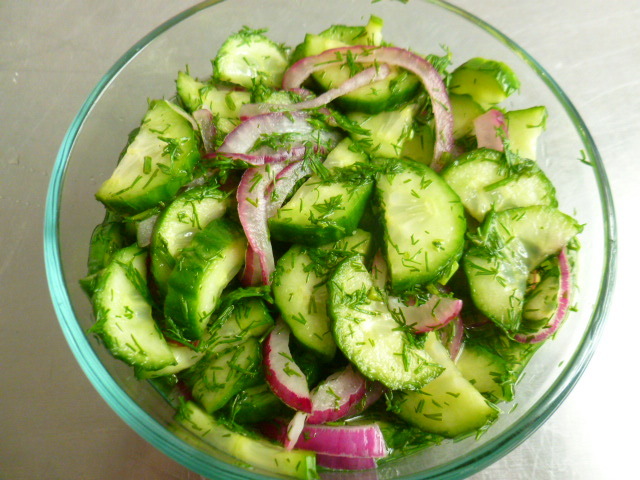 Actually, it is interesting to learn that the term “salad” originated from “sal” – i.e. salt in Latin, because the vegetables “were seasoned in brine or with a salty oil-and-vinegar dressings during Roman times” (thank you, Wikipedia!). 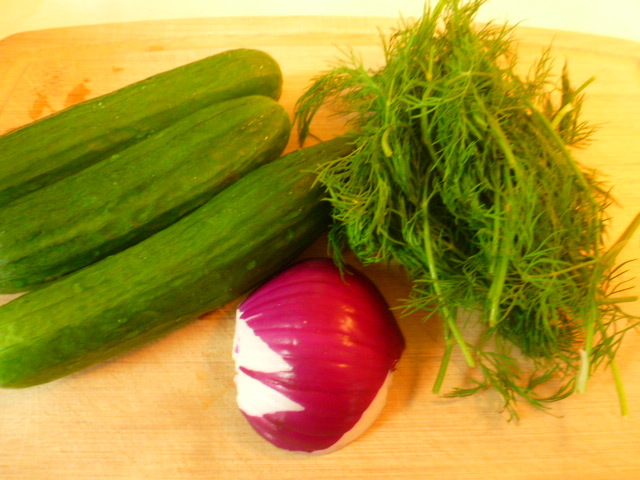 The following recipes are a good example for such salads. They can be made ahead of time, and can be kept in the fridge for a week or even more. 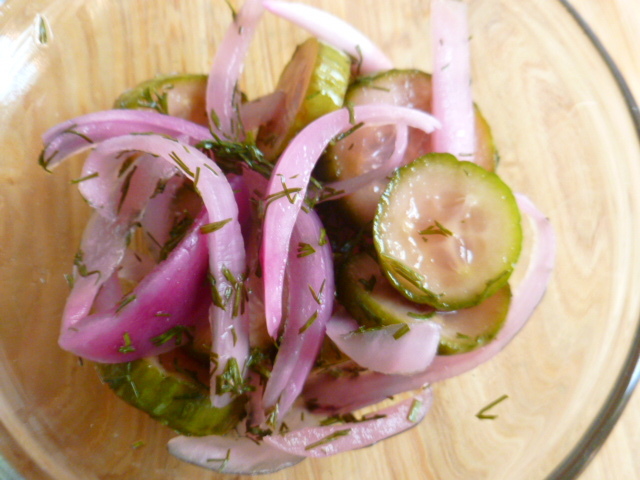 The longer they are kept, the more they will look and taste like a type of pickle or condiment. They can be served on their own, as part of a salad buffet, as a sandwich filler, or even as a side dish. Try them and enjoy. Preheat the oven to 380F (195C). Line a large sheet pan with baking paper. 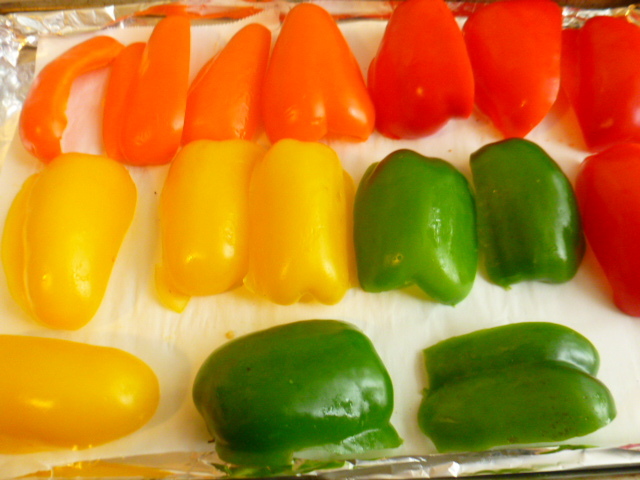 Cut 4 large peppers (preferably with different colors, as shown), into quarters. 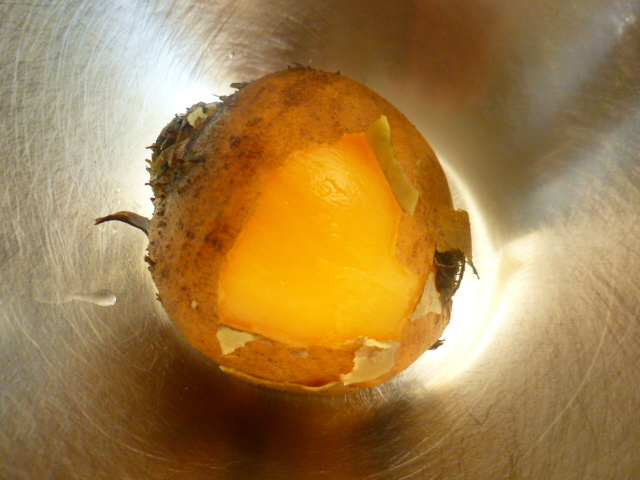 Remove the seeds and white membrane and place in the pan, skin side up. Roast for about 25 minutes, or until the skin starts to blacken. 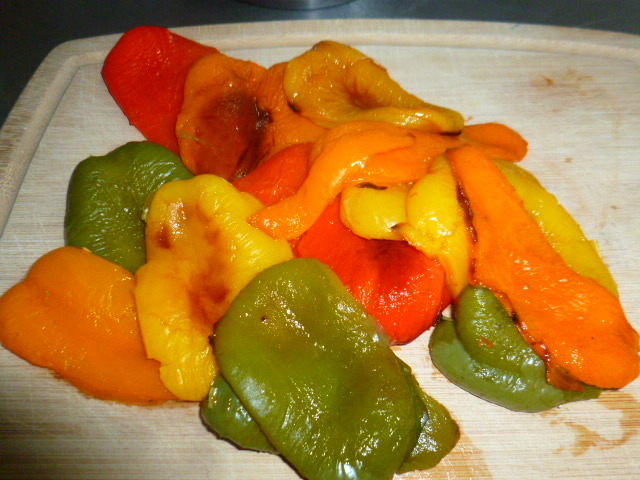 When ready, transfer into a bowl and cover it (to let the peppers sweat and make for easier peeling of the skin). 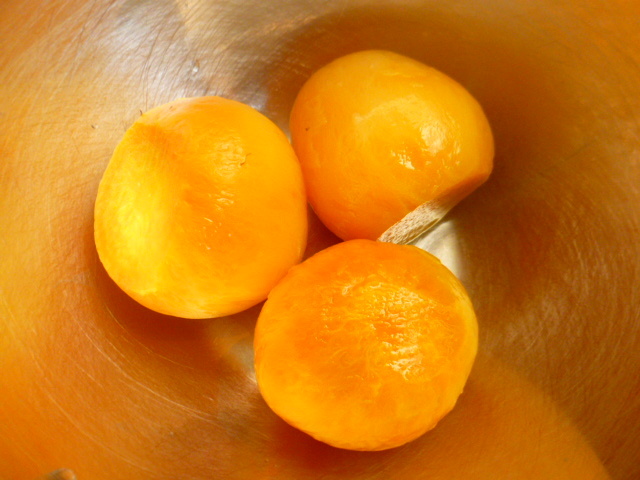 Meanwhile, mix in a large bowl 2 Tbs Dijon mustard with 2 Tbs cider vinegar, ¼ cup water, 1 tsp salt and 1 tsp sugar. 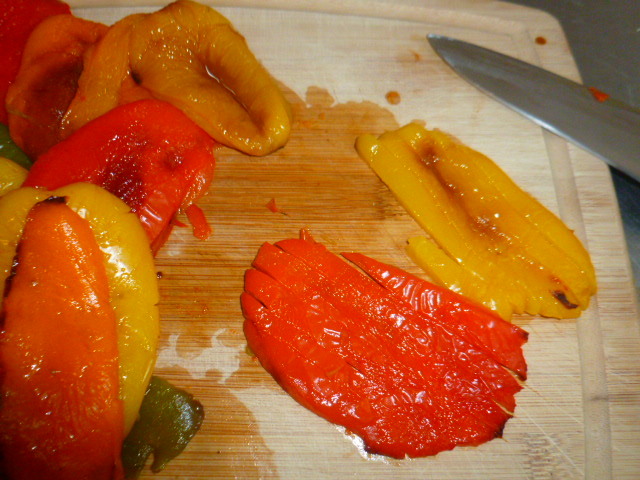 Peel the peppers skins and cut into medium strips. Add to the bowl with the mustard dressing and mix well. Transfer to an airtight container, cover and keep in the fridge for a minimum of two hours and up to a week. Preheat the oven to 425F (220C). Line a large sheet pan with baking paper and add 1 Tbs oil. 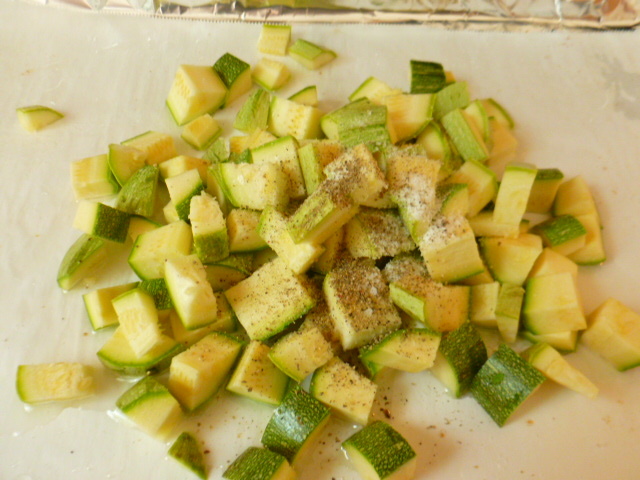 Cut 4 white zucchini into large cubes and place in the lined pan. 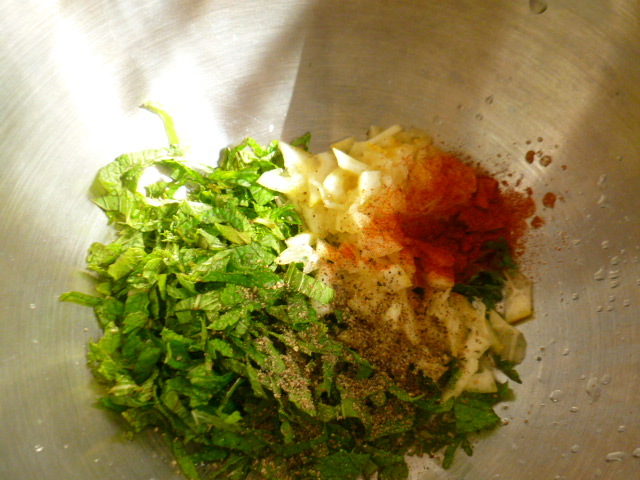 Add 1 tsp salt, ¼ tsp freshly ground black pepper, and mix. 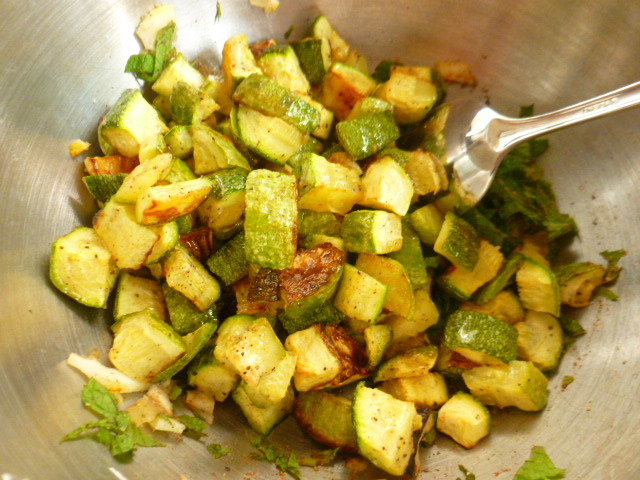 Spread over the pan and roast for about 15 minutes, or until the zucchini is golden-brown. Meanwhile, coarsely chop a generous handful of mint leaves and place in a bowl. 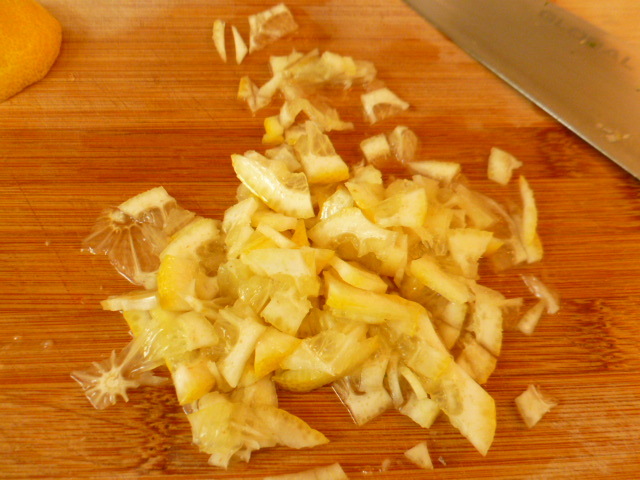 Slice ½ large lemon into thin slices. 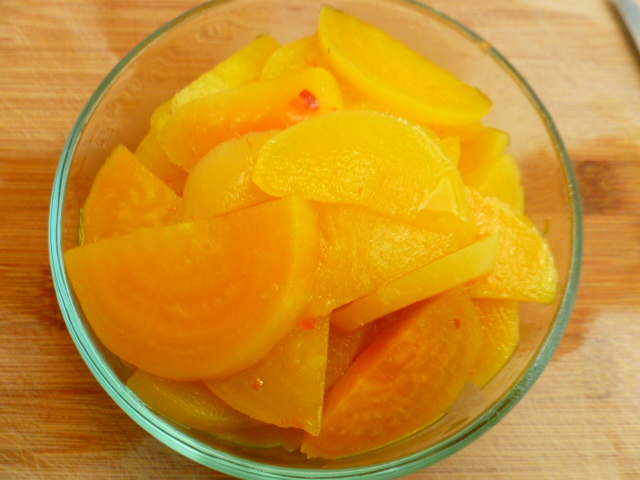 Get rid of any pits and coarsely chop the slices, skin included. 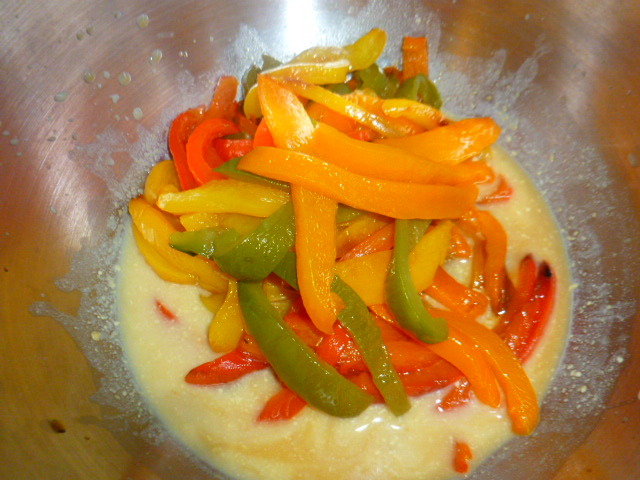 Add to the bowl, along with ½ tsp hot paprika, ½ tsp salt and ¼ tsp freshly ground four peppers mix. 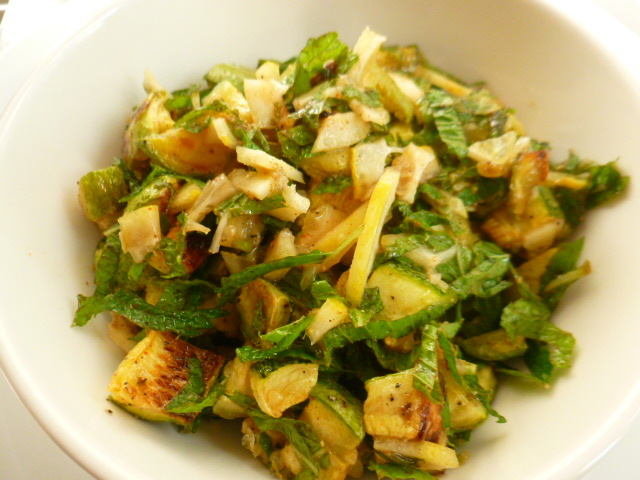 Mix and add the roasted zucchini while still warm. Mix well, taste and adjust seasoning. Pour 1 Tbs olive oil on top and mix. 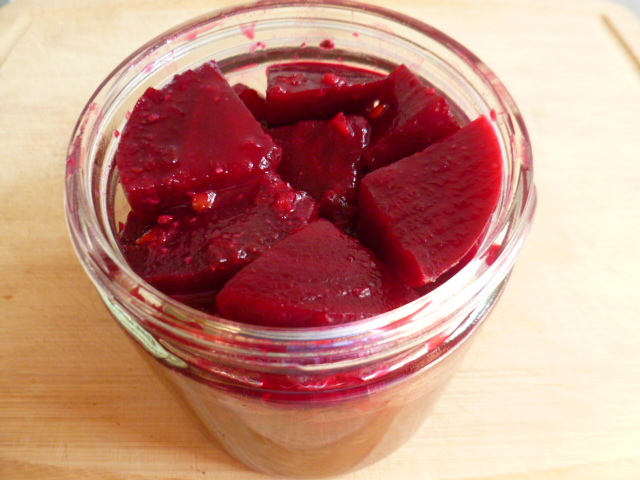 Keep at room temperature for one hour before serving, and up to a week, in the fridge, in an airtight container. 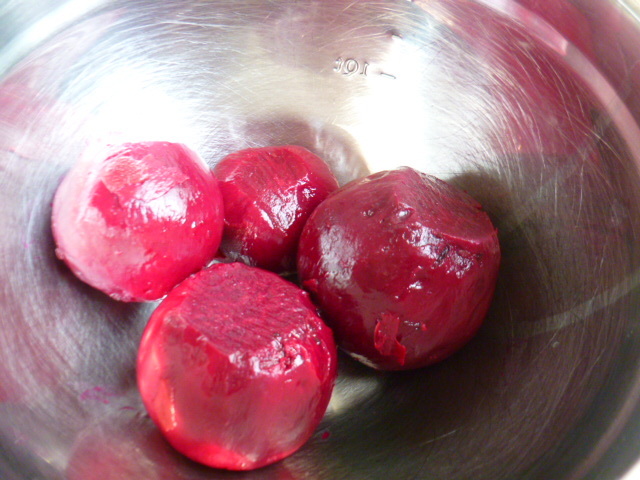 Place 4 medium red beets in a pot, cover with water and add 1 Tbs vinegar and 1 tsp salt. 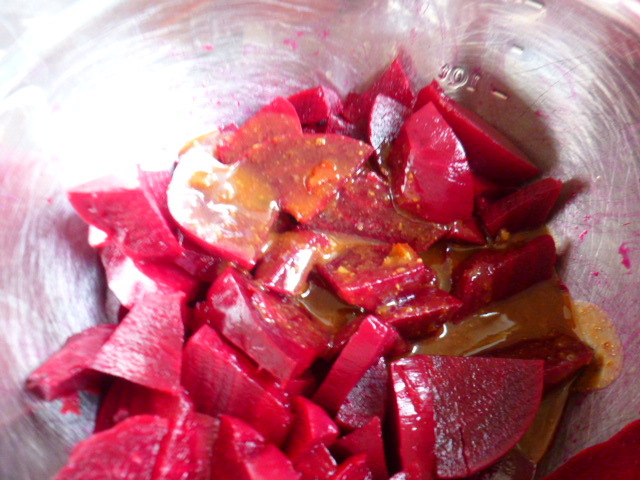 Bring to a boil, reduce the heat to medium and cook for about 30 minutes, until the beets are tender. Let cool to room temperature in the liquid. 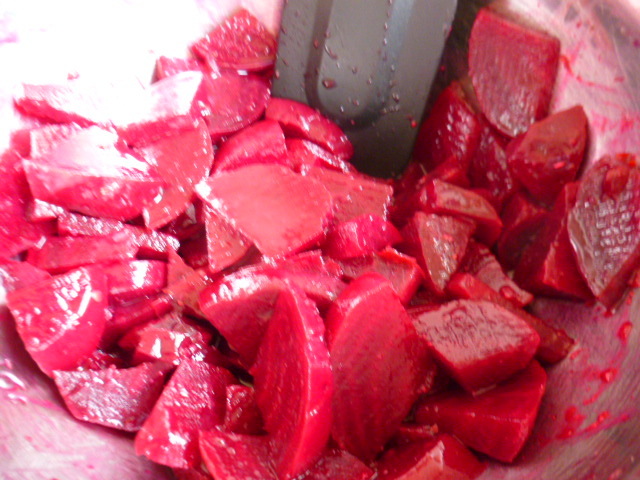 Drain, peel (best to do it using gloves) and cut each beet into quarters, then into fairly thin slices. Place in a large bowl. 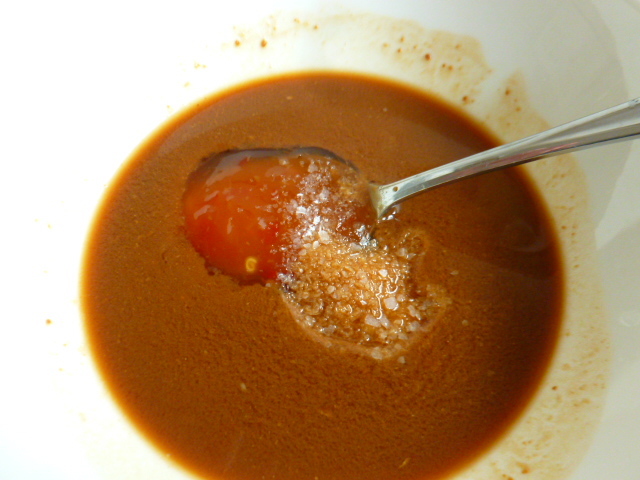 In a small bowl, mix 2 Tbs cider vinegar with 1 Tbs red miso paste. Mix well to combine and add 1 Tbs sweet chili sauce and 1 tsp salt, if needed (depending on how salty the miso is). Pour over the beets and mix. Let sit at room temperature for 1 hour, mixing occasionally. Keep, in an airtight container in the fridge, for up to 2 weeks. 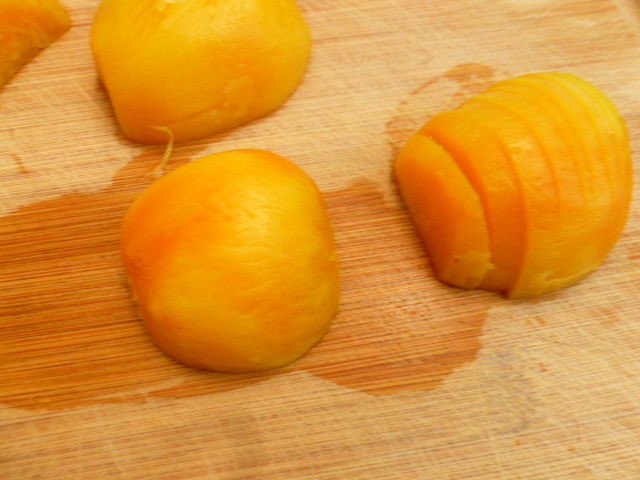 Place 3 medium golden beets in a pot, cover with water and add 1 Tbs cider vinegar and 1 tsp salt. 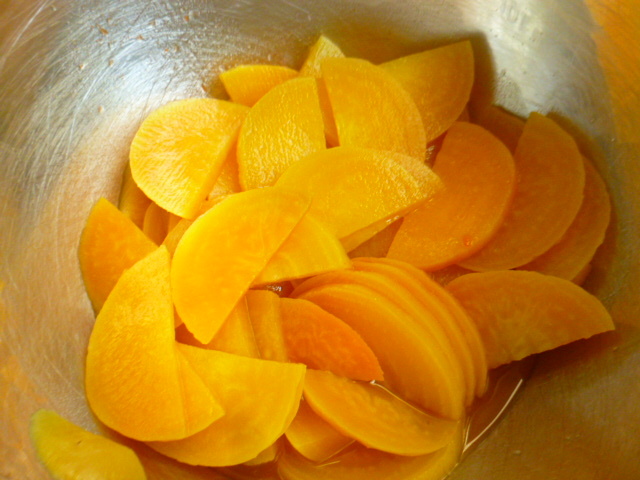 Bring to a boil, reduce the heat to medium and cook for about 30 minutes, or until the beets are tender. Let cool to room temperature. 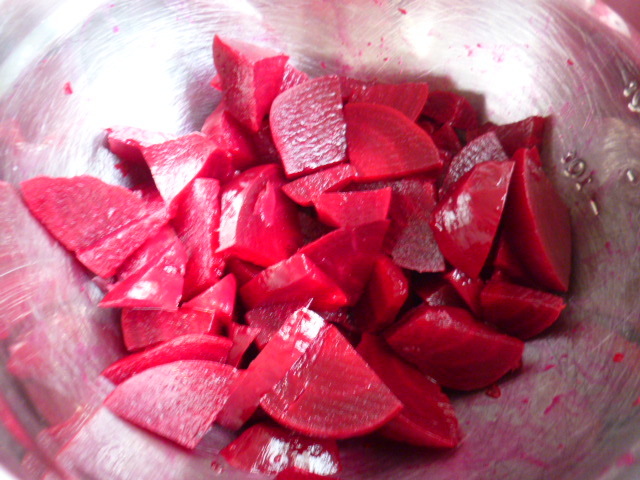 Drain, peel, and cut each beet in half, then into fairly thin slices. Place in a large bowl. 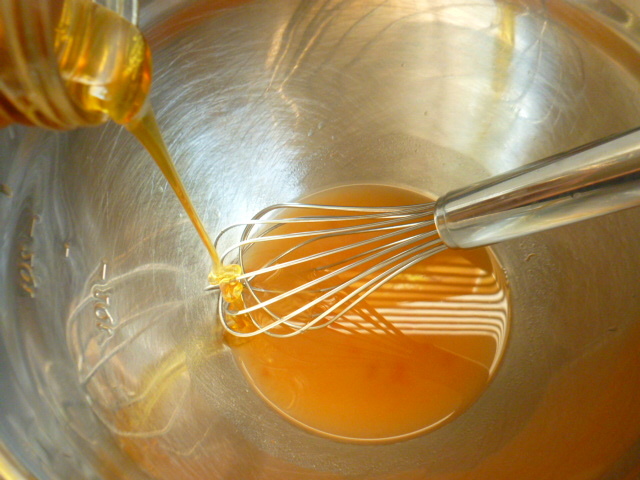 In a small bowl, mix 2 Tbs cider vinegar with 1 Tbs sweet chili sauce, 1 tsp salt and 2 tsp honey. Mix well and pour over the beets. Mix and let sit at room temperature for 1 hour, mixing occasionally. Keep, in an airtight container in the fridge, for up to 2 weeks. 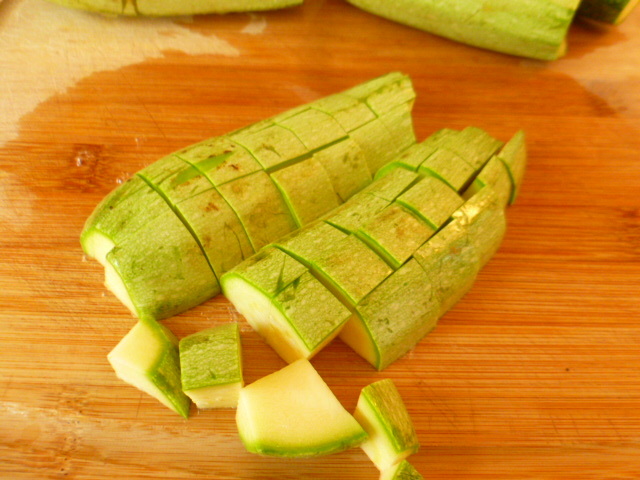 Cut off the tips of 3-4 cucumbers, cut in half, lengthwise, and slice them. 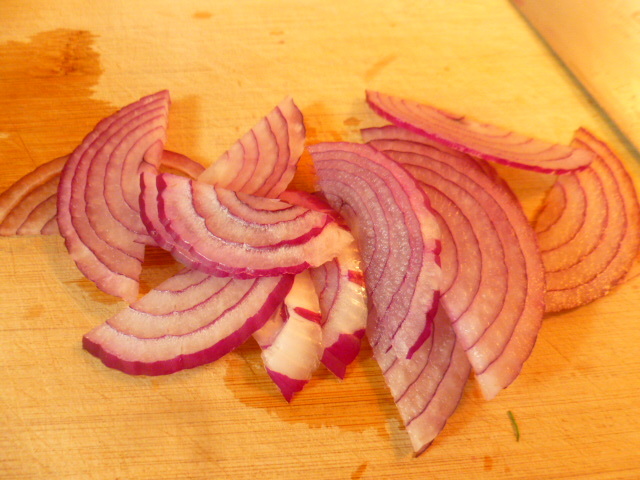 Place in a bowl and add ½ red onion, sliced thin, and ½ cup chopped dill. Season with 1 tsp salt, 1 Tbs cider vinegar and 1 tsp sugar and mix. Let stand at room temperature for of one hour, mixing occasionally. Taste and adjust seasoning if needed. Keep in the fridge, in an airtight container, for up to 1 week. 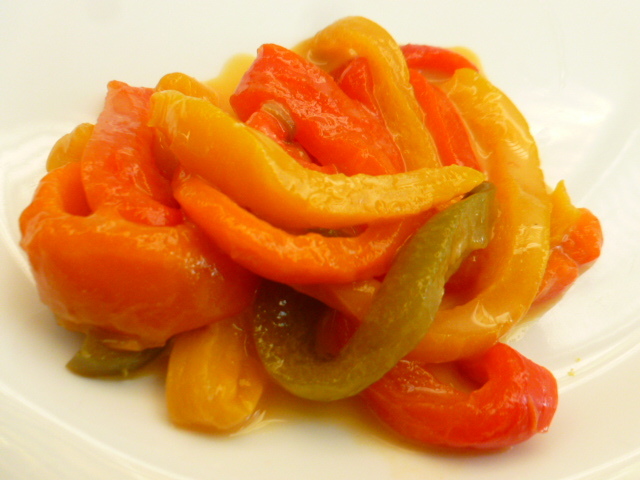 Love the idea of roasted peppers with Dijon mustard! I usually marinade them in balsamic vinegar; I have to try them your way, Ronit. It’s a whole line of mustards and pickles, and all pretty spicy. These are great ideas Ronit. I’ll have to use them to freshen up my salad routine. It’s funny. Most people hate salad but when you add the right ingredients, it can be very enjoyable. Maybe it’s just me? Lol Thanks Ronit! I love that roasted pepper salad! 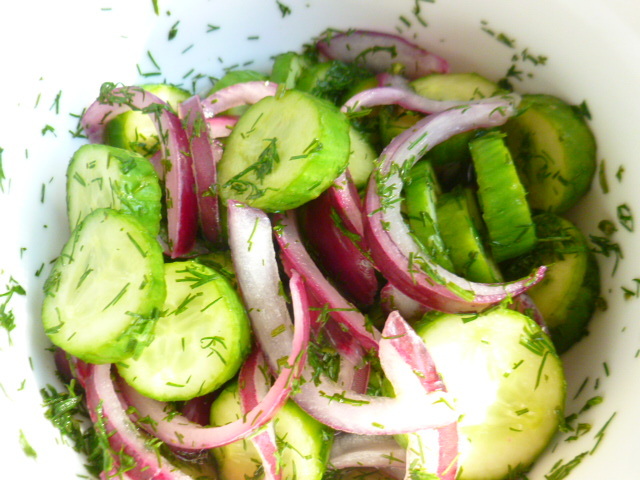 And cucumbers, red onion, and dill are so good together too! That’s why I often give choices and that way there is something for everyone! What wonderful and creative salads. I’d like to have all of these in the fridge to pick and choose from for lunch and if it ever stops snowing here, I think they would make great sides for grilled chicken or salmon. Beautiful. I would be so happy with these salads on a buffet table! I’d happily eat each one of them! Just fabulous, Ronit. I suspect the cucumbers and the beets will be my faves. **** – that’s four stars to you. They all look and sound deliciousI but I have a hot spot for roasted red peppers in any form. YUMMY! Vegetable salads are boring for my family, now I know how to make it interesting ! Thanks !! Thanks for the lovely ideas!! Will try them all! wonderful share Ronit, the salads with a twist in taste!! wow, like all the combinations!Great way to eat boring salads. 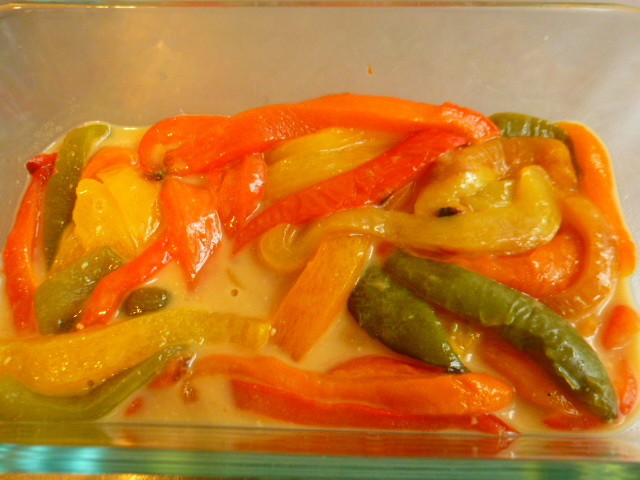 Mmmmm.. toasted peppers and Dijon mustard. This needs to be a regular star in any kitchen. 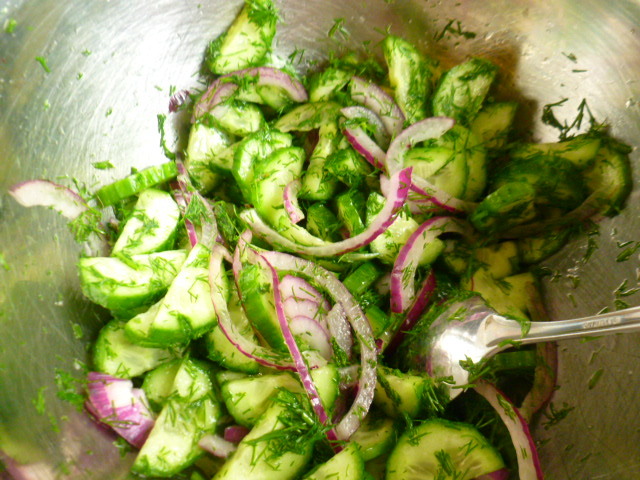 Such a great intro to this post Ronit – learnings of the origins of the name salad. Even with a simple raw kale salad I find massaging it with olive oil and salt and then allowing to sit for a little while totally changes the texture and taste! 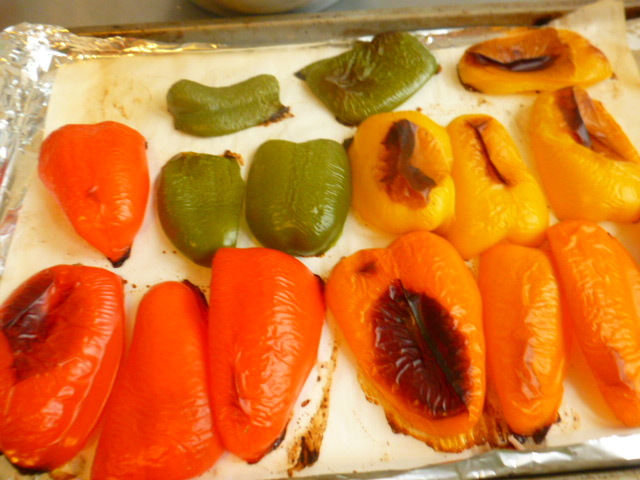 They all look so fantastic but roasted peppers are a favourite! You see all very appetizing thanks for your recipes. Usted fue una de mi primera visita a mi blog gracias, me motivo a relacionarme con los otro bloger. You were one of my first visit to my blog. Thank you, I am motivated to interact with the other bloggers. I’d love to try esp. beetroot and red miso one!! Fabulous as always – I’m a big fan of your posts! Pinned! Can’t wait to make these! They look delicious!